When it comes to zero impact cardio workouts there is nothing better than an elliptical machine. While there are various brands, models and features to pick from, sometimes you just need a basic machine to workout with. 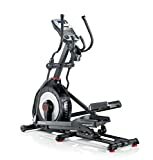 The Schwinn 430 elliptical machine is just that; an entry level elliptical tailored just for you. WHO IS SCHWINN AND WHAT DO THEY DO? WHAT MAKES THE SCHWINN 430 UNIQUE? When you think about in-home fitness, cardiovascular and full-body workouts, the name Schwinn may not be the first to pop into your mind. Perhaps it is time to rethink the brand and see what they have to offer. Elliptical machines offer a full body workout with tons of resistance options and zero impact. When you don’t like to run, or physically can’t due to medical issues, the no-impact workout of an elliptical machine can’t be beaten. The Schwinn 430 elliptical offers everything you need, without the fuss of too many bells and whistles. What is considered an entry-level device, the 430 is much more than a cost-saving unit. You will get the workout, the results and the training you need without all the extras to jack up the price. This review will take a look at the exercise side of Schwinn and the 430 machine as a whole. Does this machine belong in your home? That’s what we are here today to find out. Schwinn started as a bicycle company in Chicago, Illinois in 1865. In the years that followed the company had 30 manufacturing plants churning out over 1 million bikes per year. This, of course, was before the motorized car was made popular by Ford in the early 1900s. It didn’t take long for the German-born partners (Schwinn and Arnold) to make the bicycle company one of the most profitable and sought-after manufacturers in the world. Being based in America was a big help. The company has its history of ups and downs and none worse than 2001 one when the Schwinn company had declared bankruptcy. The company, its assets, and holdings were bought at a bankruptcy auction and moved to China. In 2010, a small company named Direct Focus, Inc. bought the name and rights of the fitness division of Schwinn. Direct Focus later became known as fitness giant Nautilus. Since then the Schwinn name, American once again, began to emerge as one of the preeminent names in the fitness industry. Along with several other fitness designs, the Schwinn name was placarded on an elliptical machine with the same care and devotion that used to adorn bikes at the turn of the century. The 430 is one model that has become a household name for elliptical owners. Though technically a Nautilus machine, the Schwinn 430 is still made with the same craftsmanship that Ignaz Schwinn brought to the cycling world over 140 years ago. The name notwithstanding the quality of the product is something all parties involved (even just by name) can be proud of. The 430 is seen as an entry-level machine because it lacks a certain panache and is mostly manually adjusted. However, this also drives the price point down and makes it readily available for most homes in the country. Because it is low impact, the elliptical machine outperforms treadmills. It also has upper body resistance to offer a complete, full-body workout in one go. Something a treadmill can’t offer. The 430 may be a beginner’s elliptical machine, but it is hard to get even the most seasoned user off of it to try something newer and fancier. Besides the historical name, the Schwinn 430 offers quite a few features. While the features aren’t independent of the machine itself, having them all together in a single unit for the price point it is offered is virtually unheard of. Of the features, there are several that stick out in the eyes of those looking to make a purchase. First, it has a three-speed cooling fan that will keep you refreshed while you work out. It also has a USB port so you can keep your tablet, phone or MP3 player charged throughout your training. But these things aren’t unique. In fact, they are touted in other models as necessities that will cost you extra. Not with the 430 though; they come standard. You will also be able to adjust the incline for a more (or less) intensity for your workout. There are six stages that you can adjust too. However, you will have to adjust manually, which is seen as a downfall for other machines. This feature alone is what keeps the 430 in the entry-level stages. The adjustments aren’t difficult, though, and you can have up to two profiles stored in the memory banks of the machine for different people working out. Great for couples that may be at different stages. On top of all that, you still get more. One of the most confusing situations we have come across is why this machine is considered basic, or beginner equipment. Perhaps it is because the screen isn’t full color, or maybe it is because the 20-inch stride path can be too small for taller persons. What we do know is that the other features are not basic or beginner. You get a high-speed drive system that keeps the inertia moving at a high rate for a consistent workout routine. You will also find heart rate contact grips on the ergonomic handles. The handles are also fixed and padded meaning you can find your level of comfort on the grips and maintain control of the workout. What you won’t do is struggle to keep a handhold and find the handlebars getting away from you like you often do with other high-end machines. If you are looking for range and intensity, you will find it in the 430. There are over 20 programmed routines and 20 levels of computerized resistance to ensure you get the most out of your workout. You won’t struggle unless you want too, and the harder you push, the harder the machine pushes back. If that isn’t enough for you, how about name brand peace of mind? Not only is the Schwinn name synonymous with quality, but the Nautilus name is synonymous with performance. Here you get both. A ten-year warranty on the machine that is more than double most machines at twice the price. The warranty includes ten years for the frame, two years for the computer, one year for the electronics and 90 days for assembly labor. Functional, unique, budget-friendly and performance enhanced. That seems pretty unique to us. The price of the 430 elliptical is constantly being lowered. The machine is a few years old now and finding a new one isn’t difficult at all. However, because newer models are being produced and released, the price is always dropping. On the Schwinn fitness site, you can find the 430 for a steal at under $. If you want to save even more, you can find new and used machines on third-party vendor sites such as Amazon or eBay. If you go through a local dealer, you may pay a little bit more, but you can have it assembled for you for free. Online vendors and the Schwinn Fitness site will charge you for in-home assembly. On average the $ price tag will fluctuate either way by about $$ to $$, depending on where you buy and when you buy. Seasonal discounts are not uncommon. The public seems to have varied and mixed reviews about the Schwinn 430 elliptical machine. Some people love it and will report that there is not a better machine on the market while others will claim that the machine could be a lot better. What you won’t find are a lot of reviews that are in the middle. It seems that people are polar opposites about the 430 and it really is unclear why. As we will talk about in the next section, we love this machine and highly recommend it. Though it does seem to have a following and a group that detests it. One of the largest complaints is the monochrome 2D display. It isn’t fancy enough for the modern user who wants to see a full-color display with high definition graphics or a trainer video to follow along with. We can understand that, and they are available in other machines, for sure. However, the display does its job of relaying information and results to you in real time, so the fuss over graphics is really lost on us. The other major complaint comes from the manually adjusted incline. Most people want to be able to change the incline automatically without having to dismount. A fair point, although changing resistance is much better for your workout, which the machine does. If you want a different incline, though, you are stuck doing it by hand. It only takes a second. The rest of the reports and reviews are all accolades. From the rugged and durable design, to the space saving size and even the easy to assemble piece s(which save on labor costs). Every aspect of the machine (with the exception of the two mentioned above) are given rave reviews time and again. Most people love the silent operation and the wide track foot pedals that accommodate most couples without a fuss, so that they can work out together on the same machine (just not at the same time, please.). As we have hinted at and stated throughout this review, we love this elliptical. It is easy to put together, in fact, it took us just shy of 15 minutes in the office. We had it set up and running out of the box with very little effort. We tested the USB port, and it kept our high-drain smartphone fully charged even through a couple of hours of YouTube music videos. We also love the high-inertia motor that kept us moving at a very consistent and regulated speed. Unlike a few machines we have been on, we didn’t once feel uncomfortable or out of sync. The handles really are “grip-anywhere” and we tested several positions that all worked well. The heart rate monitors in the handles did take a few minutes to get used to, but once we did it felt natural and comfortable. We didn’t much worry about the monochrome 2D display. We checked it for our readouts on occasion, but spent the entire time looking at the music videos on our phones anyway, so that didn’t bother us. We did notice the slight disturbance in having to change the incline manually and can see why people complain about it. However, it is so fast we were off, adjusted and back on without slowing our heart rate nearly at all. There aren’t very many coupons floating around for the Schwinn 430, though there are still plenty of deals to be had. If you are patient and do your research, you can actually find some good ones. Depending on where you shop you can find discounts on the price and the shipping (which generally costs well over $50 but can be found for free or less than $100) in different places. Mostly you will find deals on assembly or saving money by assembling yourself. Which, if you can’t find a free assembly option, opt to do it yourself, it really isn’t that difficult at all. You will be hard pressed to find an elliptical that can offer what the Schwinn 430 elliptical can offer for the price it is sold for. There are better machines out there, and more automated ones to allow for a seamless workout, but the money you save with the 430 makes this a pretty open and shut deal. If you require more features or levels of incline, they are out there to be found. If, however, you want a great machine that does what it says it will do while saving some of your hard earned cash, the 430 is probably what you are looking for.